Today's top computer chips can cram about 40 million transistors onto a square of silicon no bigger than a postage stamp. That same size chip, however, might hold billions of transistors in the future world of nanometer-sized devices. A critical step towards realizing that future has been taken by Berkeley Lab researchers who have developed nanowires composed of two different semiconductors -- silicon and silicon germanium alloy -- in discrete alternating segments, like the different flavored stripes of a candy cane. These striped or "superlatticed" nanowires can function as transistors, LEDs (light-emitting diodes) and other optoelectronic devices, biochemical sensors, heat-pumping thermoelectric devices, or all of the above, along the same length of wire. 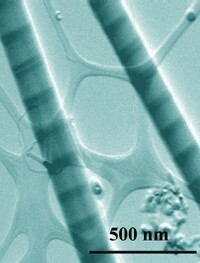 In this image taken with a scanning transmission electron microscope, two nanowires feature alternating bands of silicon (light) and a silicon germanium alloy (dark), which form interfaces that could be made into transistors, LEDs, and other types of electronic devices. Each wire is less than a hundredth the diameter of a human hair. "The success of today's two-dimensional semiconductor integrated circuits has largely hinged upon carefully controlled doping and interfaces," says Peidong Yang, a chemist with Berkeley Lab's Materials Sciences Division and a professor of chemistry at the University of California at Berkeley (UCB), who led this research. "Our technique puts that same controlled doping and interfaces within one-dimensional nanostructures." For the past 35 years, microcircuit manufacturers have been able to double the number of transistors on a silicon computer chip every 18 months -- a shrinkage rate known as "Moore's Law" after the Intel Corporation's cofounder, Gordon Moore, who was first to call attention to the trend. The smallest features of today's transistors now measure about 100 nanometers across (about four millionths of an inch), but within the decade entire transistors are expected to shrink to this size. That may be as small as microtechnology can get. Two-dimensional microchips have been likened to sandwiches, in that they are made by depositing layers of different types of semiconductors with different electrical properties on a wafer of silicon. It is the interfaces between these different layers that control the flow of electrons and enable transistors and other electronic components to function. 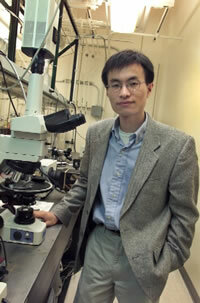 Now, Yang and his team can offer the same electronic diversity of a microchip in a one-dimensional nanoscale platform. "This is a major advancement in the field of one-dimensional nanostructure research," says Yang. "It gives us the ability to create various functional devices, such as p-n junction, a coupled quantum dot structure, or a bipolar transistor, on a single nanowire, which can then be used as a building block for constructing more complex systems such as electronic circuits, LEDs, and thermoelectrics." Other research groups have been able to make nanowires out of a single type of semiconductor and have even created interfaces by criss-crossing two or more wires made from different semiconductors. The striped nanowires of Yang and his group offer much more ideal interfaces and are are much better suited for commercialization. Working inside a 2.5 centimeter (one inch) tube furnace, they grow their wires using a hybrid "pulsed laser-ablation/chemical vapor-deposition" process. A silicon wafer coated with a thin layer of gold is introduced into the furnace. When the furnace is sufficiently heated, the gold film forms a liquid alloy with the silicon and spontaneously breaks up into nanometer-sized droplets. Vapors of the two semiconductors will then condense around the gold droplets as deposits, which become nanowire segments. Chemicals are used as the source of the silicon vapor and a laser is used to vaporize the germanium. When the laser is off, only silicon is deposited on the gold particles; when the laser is on, both silicon and germanium are deposited. Explains Yang, "By periodically turning the laser on and off -- and this can be readily programmed -- we can form a silicon and silicon germanium superlattice on every individual nanowire in a block-by-block fashion. The entire growth process resembles the living polymerization synthesis of a block copolymer." Yang also says the use of two independent vaporization techniques, unique to his research effort, enables him and his group to achieve "remarkable periodicity" for their blocks of silicon and silicon germanium. The technique is efficient and cheap. In just one hour they can make millions of striped nanowires at a relatively small cost. The potential of these tiny wires is enormous. Striped nanowires might one day be assembled into complex circuits and faster computer chips. They might also serve as nanoscale light-emitting sources that could be integrated into light-speed optocommunication systems. Striped nanowires could even serve as powerful sensors of chemical and biological agents. Contact with extremely low concentrations of a chemical or biological agent is enough to cause a change in the electronic state of a striped nanowire, which can be used to identify the agent. "We are not there yet for many of these potential applications, but we have developed a powerful platform on which a tremendous amount of opportunities will be explored," says Yang.